A Bed Every Night. How did it go and what happens next? 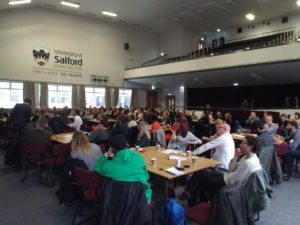 The Greater Manchester Homelessness Action Network is a collaboration of organisations, charities, the public and private sectors, businesses, faith networks and individuals in Greater Manchester working together with one aim of ending homelessness in Greater Manchester. Last November saw the implementation of A Bed Every Night which hoped to give everyone in Greater Manchester sleeping rough a safe place to stay for the night and the appropriate support every night. Then to help people move away from the streets and into secure accommodation. It was an ambitious mission and it has proved a considerable task for all those concerned. It has received a lot of criticism. Yet the fact that many more people are inside at night who might otherwise have slept on the streets cannot be ignored, and we now have more insight into who is out there and needing support. 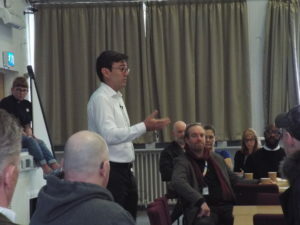 Following an introduction by Andy Burnham and a brief presentation from Real Change (find ways to help in GM here), workshops took place to reflect on what impact A Bed Every Night has had, shortfalls in the provision and what we could do next. You can read the headlines below. It has been a huge challenge, and so many people have worked so hard to make this happen. There is lots of feedback and ideas to consider, alongside raising more funds and looking for available space for provision. As the next phase of supported provision is decided, we’ll keep you posted here. Access: How should we work with the homelessness reduction act? A single point of access in each borough that is a multi-agency hub to access both ABEN and statutory provision (priority need). Also access emergency bed spaces if out of hours. 24hr access, run by a 3rd sector agency but working with statutory services e.g. housing options team. Move On: What pathways could open up to help people move on? Let us open up more move on pathways especially for NRPF, Complex Needs and Young People but we also need to ensure that there is support that follows the people we move on. Health: How do we better align our existing health services? Health needs to be part of the whole, take a holistic approach to understanding need. Use our existing services more effectively by increasing outreach offer. Partnerships: How do we best create partnerships within and beyond our local areas? A greater quality, clarity and communication from ‘a single source of truth’ available to all partners will improve partnership.